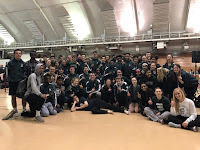 A beautiful spring day greeted a small committed group of Madison Memorial girls track & field athletes who traveled to Homestead HS in Mequon to take on some talented southeastern Wisconsin competition. These girls represented their team amazingly today scoring 48 points to place 6th out of 16 schools. A mix of youth and senior leadership on the day proved the girls team is ready to make a strong stretch run for success at the city, conference, & state levels. We look for even better performances from both varsity & jv kids as we enter championship season and hope for some more beautiful spring weather. The girls team were led by their lone event champion senior captain Christina M who through a lifetime PR of 113' 8" to earn the win in the discus. Her sophomore teammate Holly H also PRed (by 10 feet) in the discus throwing 103' 10" to take 3rd place. Other girls scoring for the team with their top 8 performances included Christina M (7th - 31' 2.75") & Holly H (5th - 32' 0) in the shot put, Kayla G taking 3rd in the pole vault with a clearance of 9' 6", Mariah OF taking 5th in the 300m hurdles (52.59) & 7th in the 100m hurdles (17.74), Izzy O placing 6th in the 1600m run (6:00.14), Carly H finishing 8th in the 1600m run (6:04.59), and Margot W placing 5th in 13.35 in the 100m dash (13.08 in prelims). Additionally, two relay teams scored points the girls in the 4x200m relay combined for a time of 1:52.97 earning 7th and the 4x800 squad placed 5th with a time of 10:31.78.Other notable performances from the meet include PRs by: Amelia F in the 800m run (2:32.13), Marcella V in the 400m dash (1:07.33), and Emma Cate M in the 100m dash (13.66).